**** Chosen by Winner: Christopher H.
The EX-A01 was the first Automatic Knife in the Hogue/Elishewitz Extreme Series Knives. It was designed to be extremely durable, yet simple, elegant and practical for everyday activities. Everyone from electricians to campers and soldiers to everyday users can find one to their liking. At first glance, the EX-A01 looks like a piece of jewelry, but do not let its attractive appearance fool you. Inside this knife beats the heart of a beast! The oversized pivot, stop pin and robust button lock are heat treated stainless steel which provides a vault-solid lock-up. Auto-opening is via the same push button with an authentic Wolff Gunsprings spring tested to over 10,000 deployments without failure. The manual safety ensures that the blade won't open inadvertently and also locks the blade in the open position, giving fixed blade-like reliability. The EX-A01 is an over-engineered tool whose sole purpose is performance. 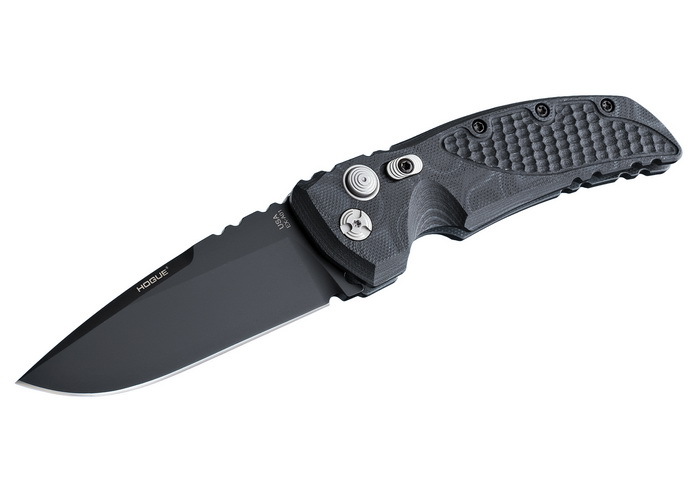 This EX-A01 has a black coated blade and G-Mascus® Black G10 handle.